Rangers have condemned fans who took part in "inappropriate singing" during Monday's victory over Hibernian. Describing them as a minority, the Ibrox club have vowed to assist Police Scotland in identifying the culprits. "The football authorities and Police Scotland know the club is committed to eradicating all forms of unacceptable behaviour," said a statement. "And it is disappointing that a minority engaged in inappropriate singing." Rangers' 4-2 win over Hibs gave the Glasgow side a three-point lead over their rivals at the top of the Scottish Championship. It is not yet known whether the singing will be mentioned in the match delegate's report to the Scottish Professional Football League. But now Rangers have issued a statement, saying they believe "it is appropriate at this time to remind everyone of the club's position on anti-social behaviour within football grounds". "The club operates a zero tolerance policy and continues to work tirelessly via the Follow with Pride campaign while supporting all initiatives aimed at tackling this problem," it added. "At every home and away, pre-match operations meeting unacceptable conduct is included on the agenda with the attention of both the police and stewards drawn to the need to deal with this matter robustly. "The club will assist Police Scotland in identifying those responsible for the unacceptable behaviour on Monday." Uefa fined Rangers in 2006 and ordered the club to make a public announcement at each of their home games pointing out that the chanting of the Billy Boys was banned after it was heard during a Champions League match against Villarreal. 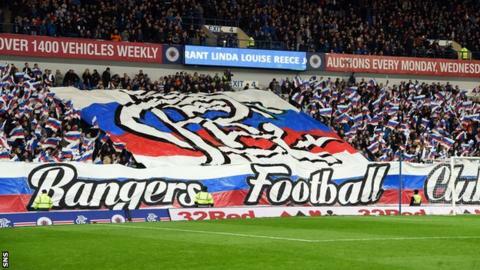 Following sectarian singing by Rangers fans at a match against Raith Rovers, the SPFL said in February that it would review its rules relating to spectator misconduct.